In my previous blog post, I talked about the challenges of delivering impactful cost savings these days. In this post I’d like to explore two areas of procurement that deserve more attention in 2014, and have been proven to reap enormous benefits. Advanced sourcing is probably one of those techniques that you know you should be using, but maybe aren’t using it at all, or not to its fullest potential. This is the year to change that. Companies that use advanced sourcing techniques in complex categories improve operating margins by 350 basis points and return on invested capital by 380 basis points. That means that by neglecting advanced sourcing you’re letting hundreds of millions of pounds in potential profits slip right out of your hands. Begin to execute large-scale sourcing events and optimise the evaluation by running ‘what-if” scenarios. Doing so will help you understand all possible implications, for every stakeholder involved. Your suppliers are the life blood of your business, so why don’t you treat them as a strategic partner. Don’t limit your suppliers to providing you with physical goods, when they can be fountains of creative ideas, industry knowledge and technical expertise. Work with your suppliers to share your needs and take the time to learn their R&D initiatives, partnerships and more. Doing so could quickly put you in front of your competitors and with an inside source that no one else has. 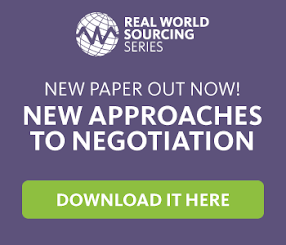 Are you using advanced sourcing and collaborating with your suppliers? What benefits have you seen?